Deal Book. Volkswagen AG makes and sells some of the finest automobiles in the world, and if it’s not a VW that we want today, then maybe an Audi, Porsche, Bentley, Bugatti , Lamborghini, Skoda, or Ducati, or a Scania or MAN truck or bus, which they also own, and last year they sold a record 9 million vehicles – one for every person in New York city or the less congested State of Michigan – for top-line sales of $254 billion and a net income of $28 billion (Bloomberg, June 17, 2013, Qatar Holding sells Porsche voting stake back to families). The ownership is complicated but the car makers are essentially owned and controlled by the two legacy families, Piëch and Porsche (ibid, Bloomberg) and the total common shares outstanding is 2.22 billion (which is a sponsored American Depository Receipt (ADR) traded in New York), but the float is only a third of that at 874 million; the company is primarily listed in Berlin (VOW:BER) with 295 million shares outstanding at the much higher price of €155 but the stock price performance is the same as in Exhibit 1 below. VW became eligible for the Perpetual Bond™ at $30 last year and is currently trading at $41 and just below the current Risk Price (SF) of $42 which is flat to slowly declining. Our estimate of the current downside in the stock price due to the demonstrated volatility is minus ($5) per share and the stock could be trading between the current $41 and $36 or $46 without surprise. The current dividend on the ADR is annual at $0.67 per share for a payout of $1 billion and a current yield of a modest 1.6% or less than 3% of the net earnings after tax. 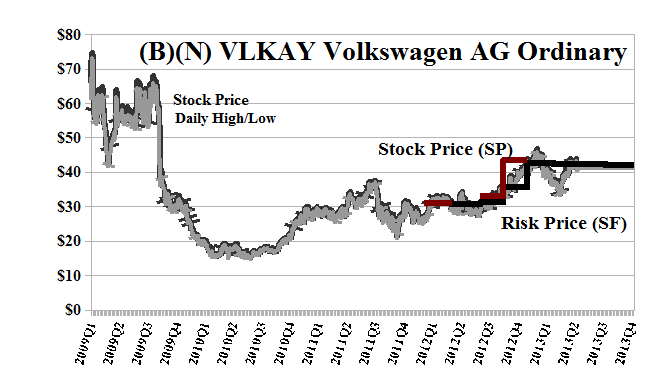 There is also a substantial overhang of the stock in the mandatory convertible preferred shares associated with the acquisition of Porsche last year (ibid, Bloomberg), so that if we were going to stay in the stock and defend ourselves against an ambient volatility, then a “collar” would be recommended but there are no tradeable options. Unlike the cars, the stock can only be driven from the back seat. Volkswagen AG is engaged in the business of manufacturing automobile. It operates production plants in fifteen European countries and a further six countries in the Americas, Asia and Africa. From the Company: Volkswagen AG, together with its subsidiaries, engages in the manufacture and sale of automobiles worldwide. The company operates in four segments: Passenger Cars and Light Commercial Vehicles; Trucks and Buses; Power Engineering; and Financial Services. The Passenger Cars and Light Commercial Vehicles segment is involved in the development of vehicles and engines; and production and sale of passenger cars and light commercial vehicles, and genuine parts. This segment also offers motorcycles. The Trucks and Buses segment engages in the development, production, and sale of trucks and buses, as well as genuine parts and services. The Power Engineering segment is involved in the development and production of large-bore diesel engines, turbo compressors, industrial turbines, and chemical reactor systems, as well as the production of gear units, population components, and testing systems. The Financial Services segment offers dealer and customer financing, leasing, banking and insurance, mobility, and fleet management services. The company provides its products under the Volkswagen Passenger Cars, Audi, SEAT, ŠKODA, Bentley, Bugatti, Lamborghini, Porsche, Ducati, Volkswagen Commercial Vehicles, Scania, and MAN brand names, as well as financial services under the Volkswagen Financial Services brand name. It operates primarily in Europe, North America, South America, and the Asia-Pacific. The company has strategic alliance with Daimler AG. Volkswagen AG was founded in 1937, has 550,000 employees, and is headquartered in Wolfsburg, Germany. The calculated Risk Price (SF) is a provably effective estimate of the “price of risk” which is “the least stock price at which the company is likeable” (Goetze 2006) and “likeability” is determined by the demonstrated factors of “risk aversion” – we want to keep our money and obtain a hopeful return above the rate of inflation – and the properties of portfolios of such stocks. Stock prices that are less than the price of risk can be said to be “bargain prices” but with the risk attached that the company might never get a higher price other than that due to ambient volatility or “surprise”; on the other hand, investors who are willing to pay the “full price” above the price of risk, and buy and hold the stock at those prices, must also be confident, and have reason to believe, that the company will produce those values, absent new information. For more information on RiskWerk, please follow the Tags or Categories attached to this Letter or simply enter Search for additional references to any term that we have used. Related data may be obtained from us for free in a machine readable format by request to RiskWerk@gmail.com.Disclaimer Investing in the bond and stock markets has become a highly regulated and litigious industry but despite that, there remains only one effective rule and that is caveat emptor or “buyer beware”. Nothing that we say should be construed by any person as advice or a recommendation to buy, sell, hold or avoid the common stock or bonds of any public company at any time for any purpose. That is the law and we fully support and respect that law and regulation in every jurisdiction without exception and without qualification to the best of our knowledge and ability. We can only tell you what we do and why we do it or have done it and we know nothing at all about the future or the future of stock prices of any company nor why they are what they are, now. The author retains all copyrights to his works in this blog and on this website. The Perpetual Bond®™ is a registered trademark and patented technology of The RiskWerk Company and RiskWerk Limited (“Company”) . The Canada Pension Bond®™ and The Medina Bond®™ are registered trademarks or trademarks of the Company as are the words and phrases “Alpha-smart”, “100% Capital Safety”, “100% Liquidity”, ”price of risk”, “risk price”, and the symbols “(B)”, “(N)” and N*.